"I could feel it in the wind in those days, the cutting cold that would seep through all the celebrations and the growing hopes. We forgot too soon that we were not a whole people, and that we still had enemies who could match everything we could do. We were lazy. We did not look to our own, we did not remember to remain ever vigilant. The price of that failure was a harvest of thorns, a bitter reaping that cost us blood and tears." 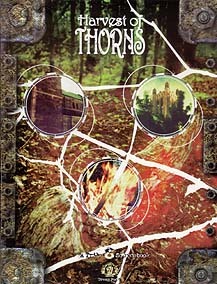 Harvest of Thorns is a cycle supplement detailing one of the silent and hidden confrontations between the Guides and a circle of powerful Tribal priestesses. This book contains the story of a conspiracy reaching back over a decade, and the men and women caught up in its epic sweep. Included are complete resources for involving your Characters in this bitter feud, including a chance to stop a mad Z'bri lord and delve deep into the secrets of the Guides. * Full character descriptions and write-ups for a powerful new shadow-cast Circle. * Further information about Z'bri heartstones and the powers of the Guides. * Guidelines for running a campaign based on a war between the shadow-cast and the Guides. * More than a dozen new NPCs.